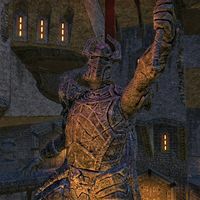 As Aldmeri society evolved, commoners stopped worshipping their own ancestors and began worshipping the ancestors of their social "betters", elevating them to the level of gods through collective adulation. Trinimac was one such ancestor. He is often referred to as the champion of Auri-El (even the champion of the entire pantheon). He's found in the pantheon of several races of elves, including that of the Snow Elves. Altmeri creation myth says Trinimac was on the front line during the et'Ada's conflict with Lorkhan, who they believe tricked their ancestors into creating Mundus. After Lorkhan's forces drove them from Atmora and sundered Old Ehlnofey, the legend says Trinimac knocked down Lorkhan in front of his army and ripped out his Heart "with more than hands", undoing the God of Mortals. But when Trinimac and Auri-El tried to destroy the Heart, the Heart just mocked them and said, "This Heart is the heart of the world, for one was made to satisfy the other", forcing them to hide it instead. Trinimac became particularly well-known for spreading what is today the Altmeri understanding of the events surrounding Lorkhan. He preached that Lorkhan's idea for the mortal realm had been a trick all along and fomented war against Lorkhan and his followers, men. He believed that "tears were the best response to the Sundering", and encouraged hatred of Lorkhan. Most of the legends of Trinimac are of his death. As the Altmer's chief protector, he fought enemies both without and within. In the Late Middle Merethic Era (or the Dawn Era; sources differ), after the Aldmer had settled the mainland of Tamriel, Trinimac and his followers became engaged in trying to halt the Velothi dissident movement. Legends say that Boethiah was angered by the "lies" Trinimac was spreading about Lorkhan. They call Boethiah the "Devourer of Trinimac", for they say the Prince tricked Trinimac, consumed him, and then assumed his form. Through dreams and visions, Boethiah convinced Veloth to build a new sect dedicated to the belief that mortals could ascend to become gods. Trinimac's priests condemned this "blasphemy", and when they were about to pass judgment, "Boethiah appeared, having swallowed Trinimac, and revealed the lies of Trinimac's teachings with Trinimac's own voice." After thoroughly shaming the priests, Boethiah relieved himself of Trinimac in front of the assembly. While most legends don't record how Trinimac was defeated, Orcish legend says that when Trinimac confronted Boethiah for the Velothi trespass and tried to fight, Mephala appeared and stabbed him in the back, bringing him to his knees while a gloating Boethiah cursed and twisted him. After he was defeated and consumed, it is said Boethiah tortured his spirit in her belly. The Daedra Lord eventually grew bored and instead exiled Trinimac to a plane of choking ash. This torture and dishonor left Trinimac twisted and enraged. Trinimac faded and was reborn as Malacath (also called Mauloch). According to legend, the dung Boethiah excreted became Malacath. The followers of Boethiah and Trinimac rubbed this excrement on themselves to change their skins. Altmeri propaganda portrayed this as a lesson on the dangers of Velothi influence, while Velothi propaganda regarded Trinimac's transformation as punishment for attempting to interfere with their exodus. Malacath himself derided this tale as being too "literal-minded" (implying the essence of the story is somewhat accurate). A small Orsimer house idol of Trinimac, dating back to the First Era. Those who agreed with Boethiah and followed the Velothi exodus became the Chimer, and Boethiah taught them many things, such as the "Tri-Angled Truth" and the rules of Psijic Endeavor. Those who maintained allegiance to Trinimac, even as their lord festered inside Boethiah and his mind became bent on revenge, "changed to match" Trinimac and became the Orcs, a people cursed to exile. They became outcasts, like their new god Malacath. Though Malacath is treated as a separate entity, he seemed to inherit Trinimac's enemies. He is known as one of the Four Corners of the House of Troubles to the Dunmer, descendants of the Chimer, and Malacath became legendary for terrorizing the domain of men. Trinimac's teachings were forbidden in the Chimer's new homeland, modern-day Morrowind. Around 3E 399, King Gortwog gro-Nagorm of Orsinium established a new priesthood devoted to the worship of Trinimac in order to espouse the understanding that Trinimac still lived, and that Malacath is an unrelated demon seeking to trick them. A minority of traditionalists within the territory, and the majority of Orcs without, viewed this as heresy. It is unknown if Gortwog's movement stood the test of time. In Sermon 8 of his Lessons, Vivec wrote that "Boethiah [...] wore the skin of Trinimac to cleanse the faults of Veloth", likely indicating that Trinimac and his followers were making it difficult for Veloth to convert people before Boethiah's intervention. Both there and in Sermon 10, Vivec made reference to the eating of Trinimac as an example of what he considered one of the particularly glorious "Walking Ways", or paths to achieving divinity. 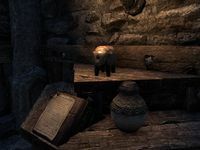 The Charwich-Koniinge Letters, Volume 4 mentions there's a statue depicting the "Transformation of Trinimac" in Amiglith, a town in Summerset Isle. Father Of The Niben suggests that the Orc creation myth may be inaccurate, as Topal the Pilot encountered creatures he called "orcs" long before Trinimac's encounter with Boethiah. ^ Dialogue of Boethiah cultists in Skyrim. This page was last modified on 24 March 2019, at 17:19.